This has turned out to be my busiest year yet. I’ve started to experiment with a much wider range of media and that will definitely continue. Acrylic paint and ink are things I very much enjoy working with and they are proving popular at workshops. PEBEO http://www.pebeo.co.uk/ is one firm that continually bring out exciting and innovative new mediums. This has, very much, been a year when students have embracing all things glittery! 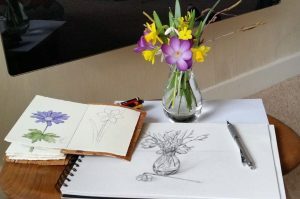 Next years workshops are looking to continue that theme although, every now and then, I get a chance to return to some of the basics, such as pencil drawing, which are a favourite with me. Looking back over all the workshops, shows and exhibitions I can’t quite believe that I fitted it all in! I’ve met many lovely people as well as catching up with old friends. 2018 is already looking to be even more hectic. No chance of retiring to put my feet up anytime soon but, I wouldn’t have it any different. My life has changed out of all recognition over the last few years and I am amazed and very grateful.